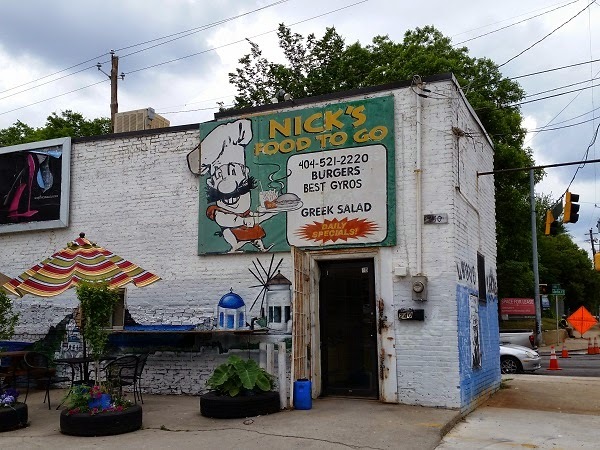 Nick’s Food To Go, Atlanta GA – Marie, Let's Eat! “Be careful of this guy,” cautioned a lady in the very small ordering room at Nick’s. Referencing Seinfeld, she whispered “He’s the souvlaki Nazi.” You sort of wish the writers of that show had come up with just about any other nickname for their pastiche of Al’s Soup Kitchen International. Nick’s has been open since 1994, and it had been on my rainy day list for quite some time. One Friday last month, our friends Helen and Vincent were in town early, and I mentioned that I was heading there for lunch. Even though they’d already eaten, they motored over to meet me and enjoy a little conversation since the weather was so nice. Then Helen realized that the special that day was pastitsio, and she couldn’t resist a second lunch. Nick Poulos technically retired last year, but he was still around – apparently he often is – to brag about how amazing his food is and assure everybody that they’re going to like what they want, just to take it outside. Don’t try to eat in his lobby. There are three picnic tables available, and during a busy lunch hour, smaller groups will get to make some new friends and acquaintances. By 2.30, the crowds have died off a little, picking back up as people swing by for meals to take home for supper. Unfortunately, they close at the disagreeably early hour of 7. I read about the fries issue in Spatialdrift’s story from a couple of years ago. There are combos available for the gyros, but these come with boring old frozen fries. I resolved to spend extra and get the proper Greek fries. These come in a portion for at least two people and they’re the best potatoes you’ll have all month. I don’t know what they do to these to make them so yummy, but the seasoning, with a little hint of citrus, is just perfect. 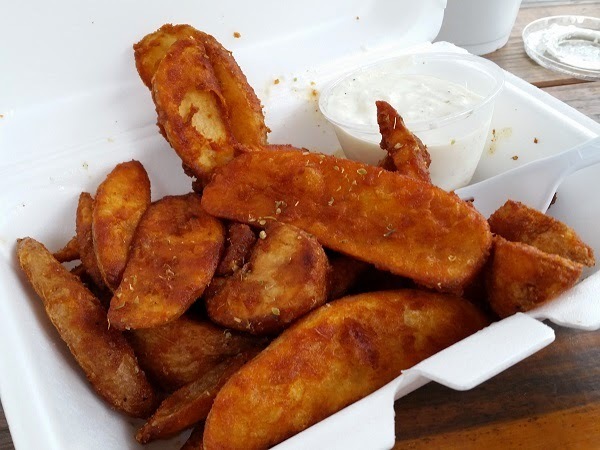 You’ll hate frozen fries even more after sampling these wonderful things. I liked the gyro a lot. Sadly, but it photographs lousy, especially with all that iceberg lettuce and white sauce in aluminum foil, but the meat is sublime, seasoned perfectly. Even though lunch was close to $15 with a drink, it was well worth it. Helen and Vincent also loved the fries and the pastitsio, and we had a fine afternoon catching up. The Poulos family’s work is fantastic, at their great little neighborhood spot. It is certainly worth a visit. Posted on June 22, 2015 August 22, 2017 by Grant G.Posted in atlanta, georgia, mediterraneanTagged atlanta, atlanta - downtown, georgia, mediterranean. That kind of fry ruins other fries, hands down! Thanks for the suggestion, Pam! I might give them a try someday. Since they allow smoking, that’s a meal I’d have to take on their patio, solo, but maybe. Marietta is close to you guys, isn’t it? Perhaps we could do a late Sunday lunch there one weekend as we swing back home? Whitlock isn’t far at all, but allowing smoking is a big roadblock to all of us eating there, as our kids can’t go. It can be pretty smokey in there. 😦 they do have a front patio. They do carry out too.